Some slatwall panel inserts can be used to increase the strength of the board so you can display heavy merchandise while others increase the visual appeal of your display but do not add any strength to the slatwall. 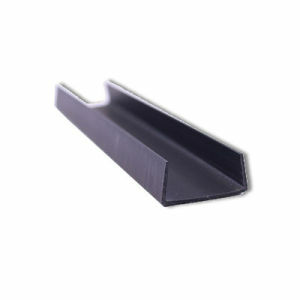 T shaped Aluminum Inserts must be installed during the manufacturing of the slatwall. These inserts increase the weight capacity to 50-60 pounds per bracket. Please call 1-800-426-5708 to order metal-reinforced slatwall - a sales representative would be happy to help you! Color Grooves Tape is a flat, flexible, non-adhesive vinyl. Comes on a roll. 1 Roll per sheet of slatwall. Colorsnaps actually snap into place after the panel is installed. Covers entire groove. Comes in 8' lengths. Plastic End Caps are 8' long and cover the ends of your unfinished slatwall. These are a great solution for covering up an unfinished edge. Some of these items will be shipped VIA common carrier. Freight will be quoted separately. You will be notified of the freight amount.